The Explosive version is full of crushed and grilled hemp which makes it highly active and literally explode out of the feeder so that your feed is released quickly. This mix is great on rivers when targeting chub and barbel but also makes a great roach groundbait. These are the only two Feeder groundbaits that you need. The Explosive version is full of crushed and grilled hemp which makes it highly active and literally explode out of the feeder so that your feed is released quickly. 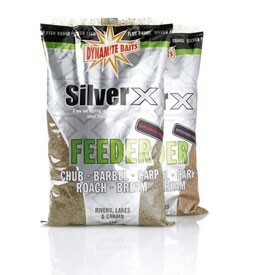 This mix is great on rivers when targeting chub and barbel but also makes a great roach groundbait. The Specimen version is brown in colour and contains plenty of crushed pellet as well as some other large particles. It's brilliant for plugging open-ended feeders and holding large quantities of loosefeed firmly in place. The pellet content makes it great for bream, barbel, tench and carp.